The Sentinel are made in USA, with Horween leather uppers, Vibram outsoles, and Gore-Tex waterproof membrane lining. 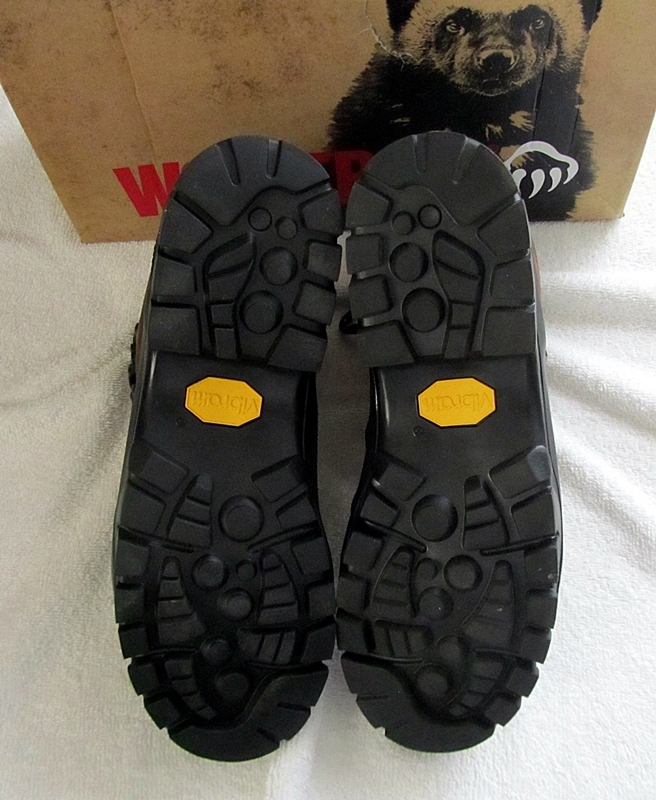 The Sentinel comes in widths EW and M in men’s sizes 7 to 12 in half sizes and 13 and 14. The available color is: Brown. In my experience, being able to pick a width for any shoe has become the exception. 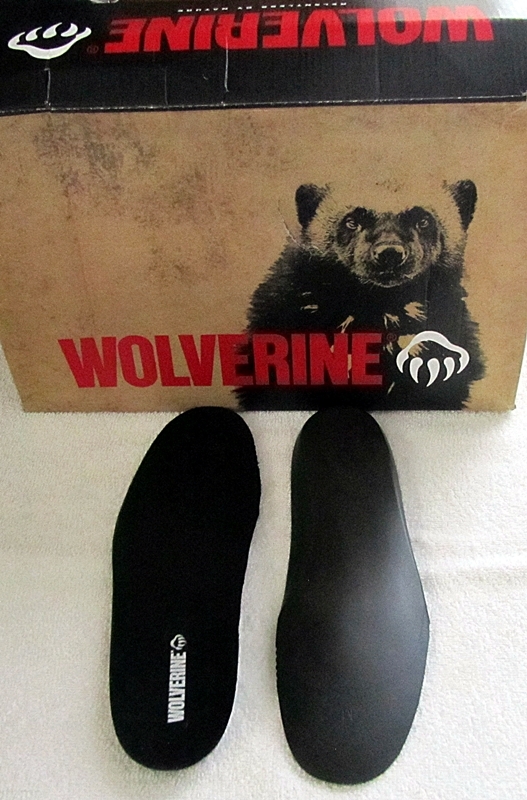 My early recollection (1940?s) of Wolverine is that they made shoes and gloves for workers in physically demanding jobs that required a tough durable product. These boots have the same rugged look that I remember. The smell of these leather boots brought back nostalgic memories from when I was living on a farm in the 40’s. This leather has a soft smooth feel and yet may resist showing wear as leather did in the 40’s. It may be odd, but I prefer hiking boots that have a dull finish, since a boot used for hiking will get scratched and dirty. In the 40’s, we did not have Gore-Tex to keep the water out. This boot is a marriage of quality leather from the past and the new high technology materials. 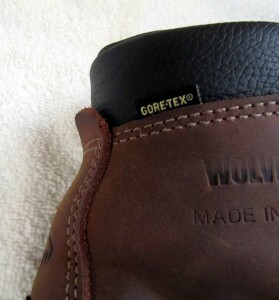 I would describe the Sentinel as an over the ankle leather boot with a Gore-Tex liner and Vibram out soles. The toe is protected by a small rubber bumper. The soles have an open spaced tread for better traction in tight rocky areas. This openness tends to prevent mud from accumulating on the soles of the boot. There are seven pairs of eyelets for lacing the boots. The lower four and sixth pairs are single riveted and hinged. The fifth pair is double riveted, not hinged, and set back slightly. The seventh pair is a simple eyelet near the top of the boot. All the single riveted lugs are flexible and move as one is walking. I have gotten very used to using a pull tab at the heel to help me put on my shoes. I thought that with a boot, which usually requires more effort, I would miss this feature. However, I found it easy to get into these boots which do not have a real pull tab. My first real use was a trip to a doctor’s office in the city. I have a standard 5-speed transmission. The round trip drive was about an hour and a half, half on the highway and the remaining in city with heavy traffic. As it turned out, the ride home was in early rush-hour stop and go and a bit of stall and crawl highway traffic. I usually have about 2 car lengths ahead of me under these conditions. However, a few drivers behind me decided that they needed to fill that void, thus I had to do a lot foot work with the clutch and brake. I found that the Sentinel boot was as comfortable as any shoe for all my shifting during this driving. I did not do a lot of walking, but what I did was very comfortable, considering it was my first time wearing these boots. My comfort was in spite of wearing a very thin pair of long wool socks which could have made even a slight discomfort more pronounced. 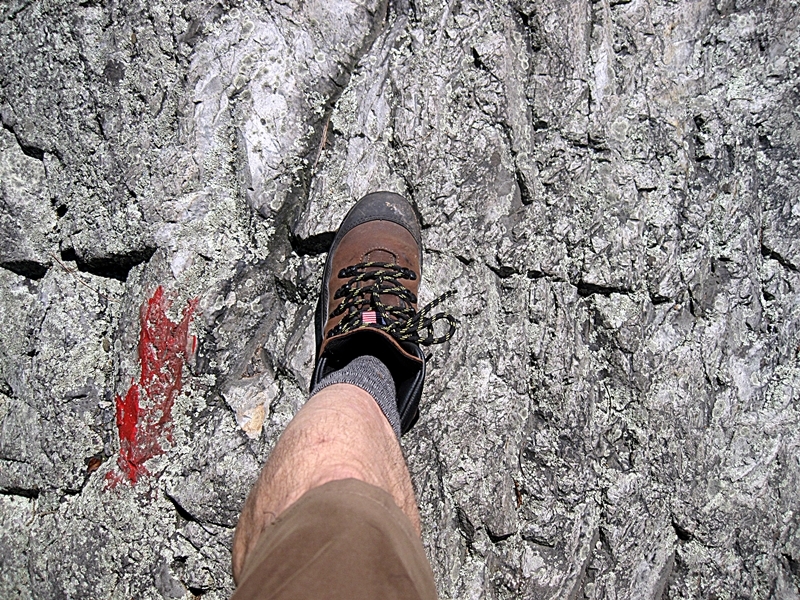 For this first try, I also was using all the eyelets for lacing, which I very seldom do when I hike. I am very pleased with the look and feel, but mostly of the comfort and support that the Sentinel boots provide. Please check back in a month when I will have done some hiking and backpacking. There is no doubt in my mind the climate is changing in New England. The month of July was consistently hot, rainy and very humid. 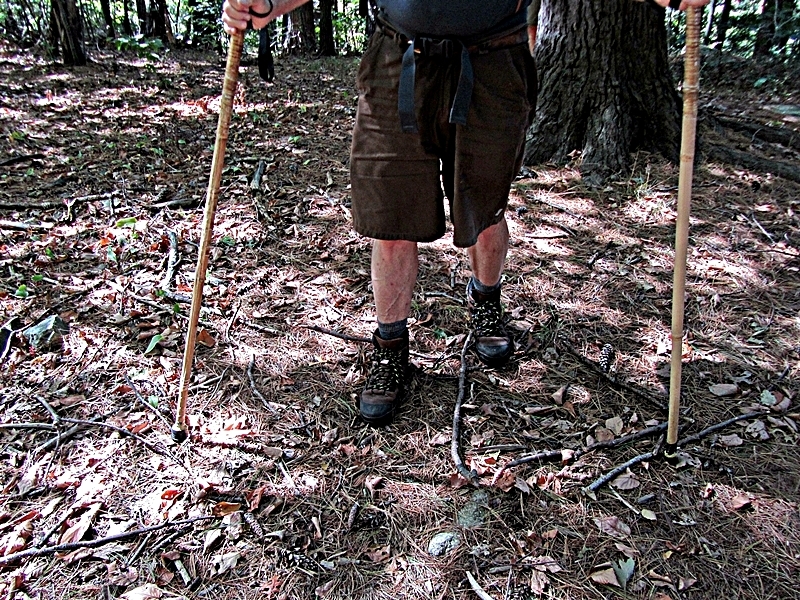 This is after a lifetime of hearing “If you don’t like the weather wait an hour it will change” After all I was in New England.” During this testing period, I wore the Sentinel boots on a backpack, 2 hikes, and very little for general non hiking use. 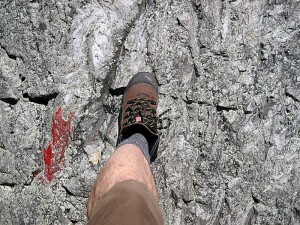 What I hope to explore are the benefits of a heavier boot over a shoe that is about half the weight. This was a 2 day backpack with a hiking friend, in what is becoming my favorite place to backpack. The Foxbrook campsite is located in New Hampshire a few miles north of Mount Monadnock. The daytime temperature was in the mid 80’s and not much cooler during the night. It did rain during the night, but this had no effect on us. The second day was a little cooler and the humidity was slightly lower. The first thing we did after arriving at the campsite, was to set up our tents and replenish our water supply at a local spring. This spring is the best water supply on this 50-mile trail known as the Greenway Trail. 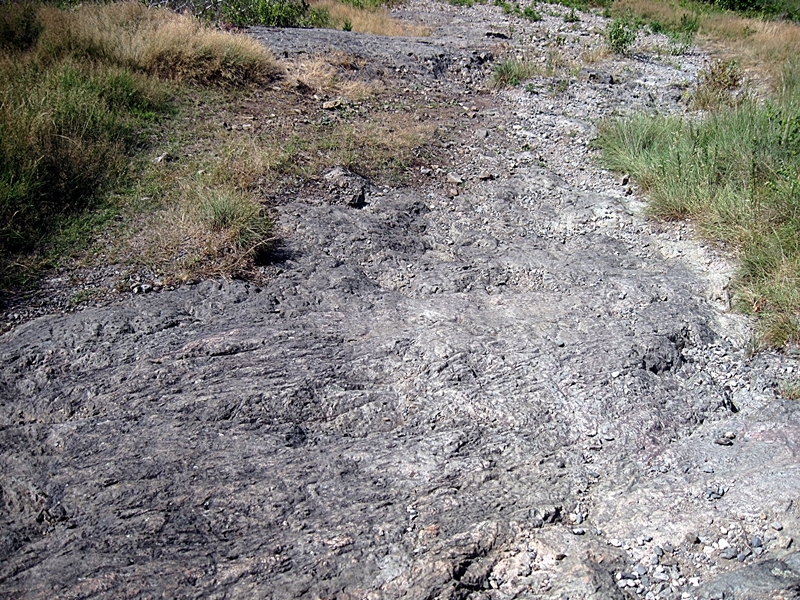 We had made good time and we had plenty of time to get on the trail again to proceed to Jackson Hill (el 2061 ft). This was probably about a mile from our campsite. Our packs were much lighter without the sleeping equipment and tent. We did take our food supply since this area has more than the average number of bears. This hike added almost an additional 2 hours of hiking, so when we got back to the campsite, I was more than ready to eat and turn in for the night. I always seem to sleep so well on these backpacks. My hiking friend stayed up and socialized with the 4 other hikers who were staying at the campsite that night. This total hike was in the 9-10 mile range. 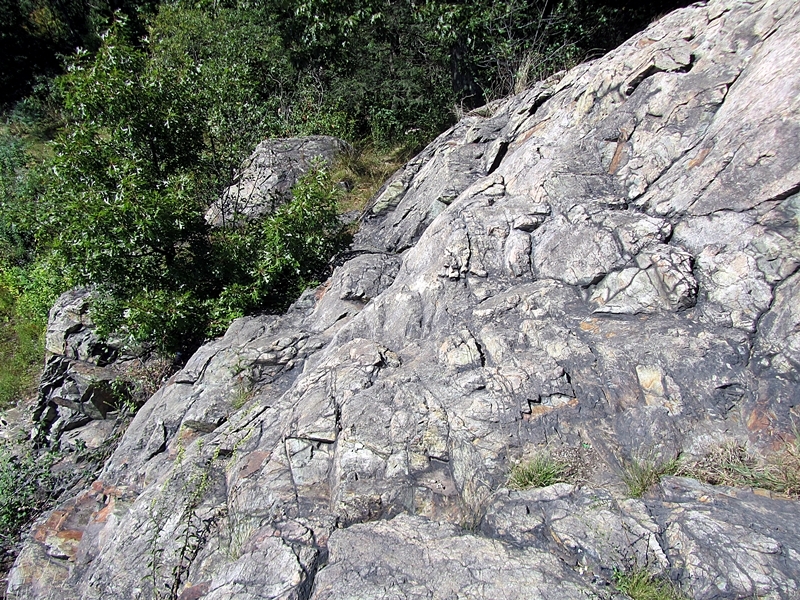 The hiking surfaces varied a great deal from flat to steep inclines and declines, sloping ledge, wooded trail where was a lot of root exposure, and small rocks. This year there has been an above average rainfall so the surfaces tended to be more slippery. Since this is probably my eleventh and twelfth time passing over this trail, I was getting very familiar with the trail and the problem areas. 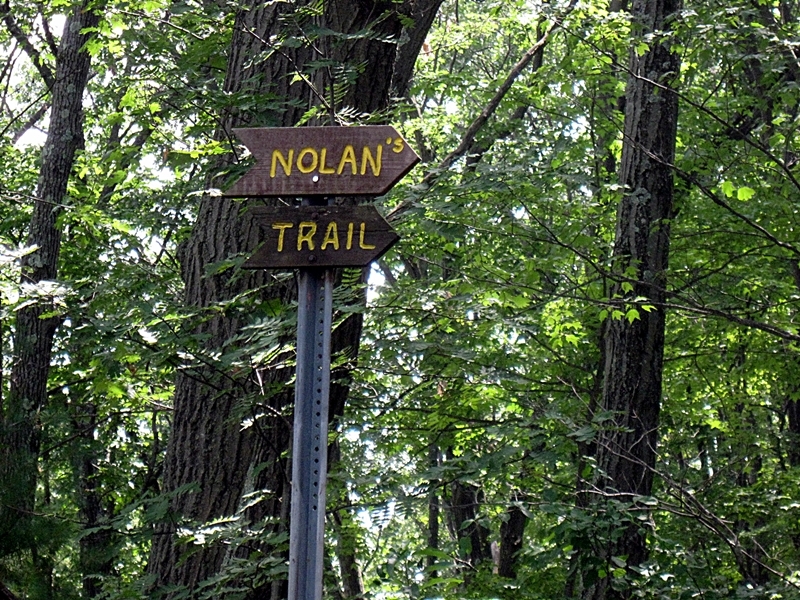 No trail stays exactly the same since nature has a way of changing trails over time. 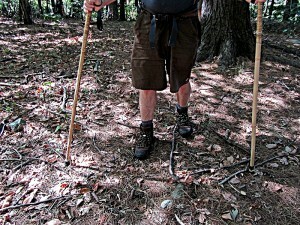 I use hiking poles and was not relying on them as much on this backpack. In areas where there were a lot of exposed tree roots, I had less trouble walking over top of the tree roots. Sometimes there is no choice but to walk on the tree roots. I had slipped on a tree root four years ago and ended up ripping some muscle which is still not fully back to normal. So you can understand my extra caution. I had no problems on this trip with slipping. It was not until we had our tents set up, that we found we had time to hike to Jackson Hill. Normally, I use both my hiking poles to set up this light weight tent. This time I used a tree instead of one of my poles. 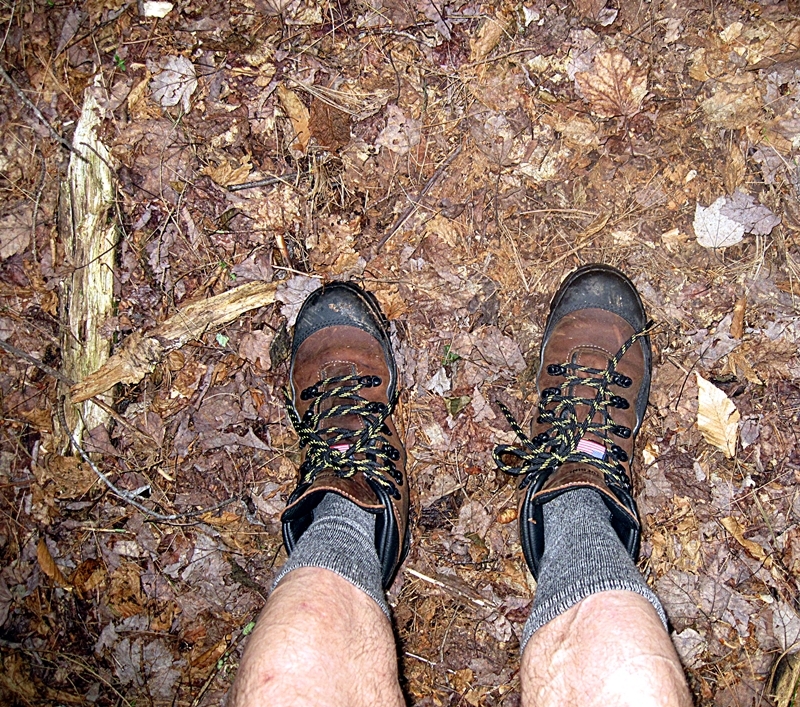 I think due to the extra stability I got from the Sentinel hiking boots, I did not notice much difference in having only pole on this almost 2-hour hike. This was yet another hike in the mid 80’s hot humid but with a slight breeze. The breeze was very much needed mostly because of very small flying insects which at first seemed like floaters in my eye. Although I had posted this 2 hour hike on an internet group, I ended up being alone on this hike. I followed the Crystal Spring trail, passed over Ward Hill, Samoset Hill, and then changed to the Saddleback path to pass over Saddleback Hill, then back to the Crystal Trail to near where I started. I have been hiking in these woods since 1970 and have found this to be a smaller scale of the forest of the White Mountains. 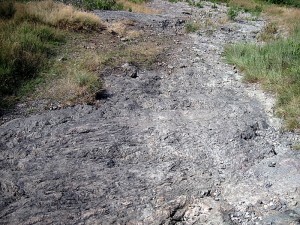 The trail I traveled was, with one exception, gentle rolling hills with hard packed soil, rocky spots, some paved spots, and ledge areas. 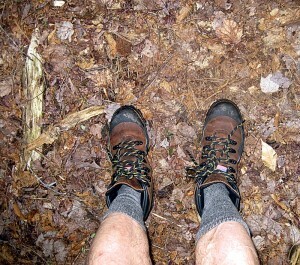 My traction with the Sentinel boots was excellent on all parts of this trail. 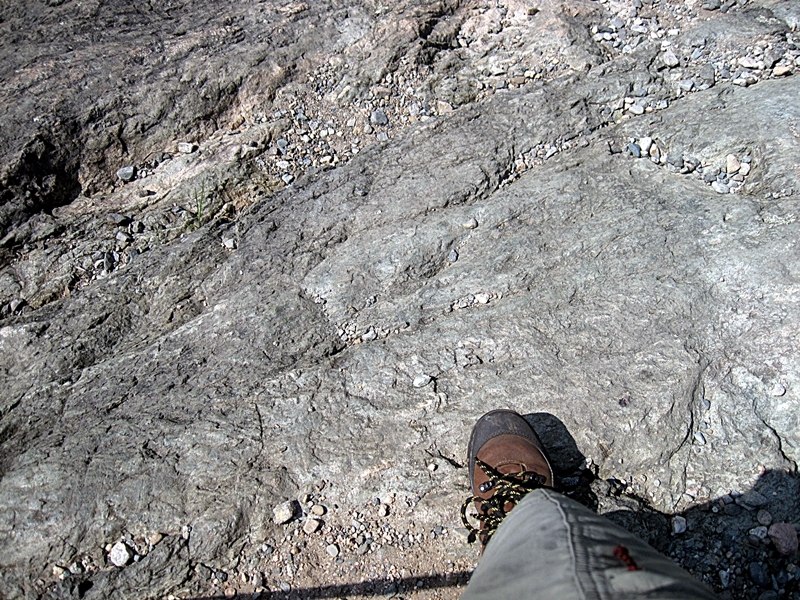 There was one place where the descent was steep and I had to take extra care, but I had no problems with slipping. I had expected to have some kind of muscle reaction due to the extra weight of these boots. I now seem to think there is an advantage in the support you get from a taller boot. These are the tallest boots I have worn for as long as I can remember. I think the extra support reduces stress on the muscles around the ankle. Please check back in about a month when I will have more to say about the Wolverine Sentinel boot. I volunteered at a half marathon,and a 5k run or walk race. My job was to watch the ice cream freezer so kids and adults took only one of the items offered. I also assisted with the cleanup when the event was over. The day started out rainy, overcast and a bit cool. I was wearing a light jacket but when the sun broke out I removed it. I spent 5 hours standing which I am not used to doing. I had decided to wear the Sentinel boots for this occasion. They were useful in keeping my feet dry when it was raining. I do not like to stand around because my feet tend to ache when I do so. Wearing the Sentinel boots, my feet were totally comfortable from start to finish. I had not expected this. 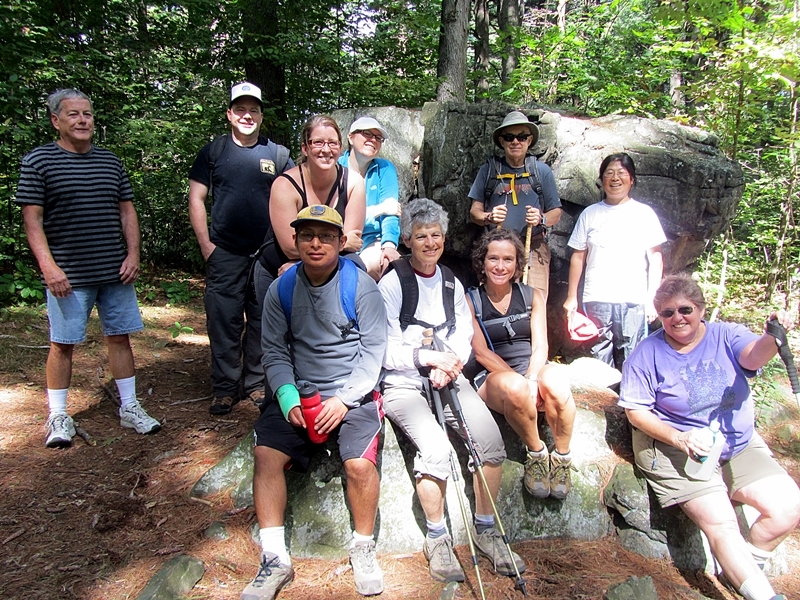 I recently learned about a weekly hike run by the DCR (Department of Conservation and Recreation). The day I went was sunny with temperatures in the mid 60’s with very little wind. There were 24 in our hiking group including the leader. This was a leisurely paced hike of less than 2 hours. We were in a part of Harold Parker that I have never been to before, which was a pleasant surprise for me. There were no steep climbs or descends. 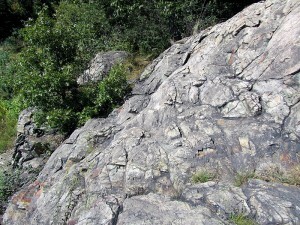 There were several areas where the rocks on the trail were small and mostly not stable. 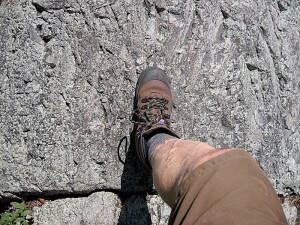 With these boots, I could see the rocks I was stepping on, but could not feel them. My footing was stable at all times and when my foot shifted a little it was never a concern for me. I am looking forward to going with this group again. The beauty of this hike is that I don’t have to sign up, just show up, and since it is less than a half hour driving distance, it is even nicer. Since my body has aged, I don’t like being on a ladder. However, there are things that need to be done where using a ladder is the quickest and most efficient way. I have 2 aluminum extension ladders and 3 homemade wooden ladders. The wooden ladders are shorter and in some ways stronger; however, the rungs are less than ¾ in wide and are easier to slip off of with shoes that have flexible soles. With the Sentinel, I could stand for long periods of time on my wooden ladder and not have to worry about slipping off the rung, or feeling the rung through the boot sole. The main job this year was to replace several clapboards which had been compromised. Removing clapboards that have been on this house for 63 years is tedious especially because I do not want to damage the good clapboards surrounding the bad one. This is not something I like doing but the Sentinel boots did make the job easier. 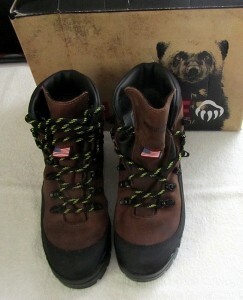 I have also used these boots on a ladder to cut branches from trees in my back yard. 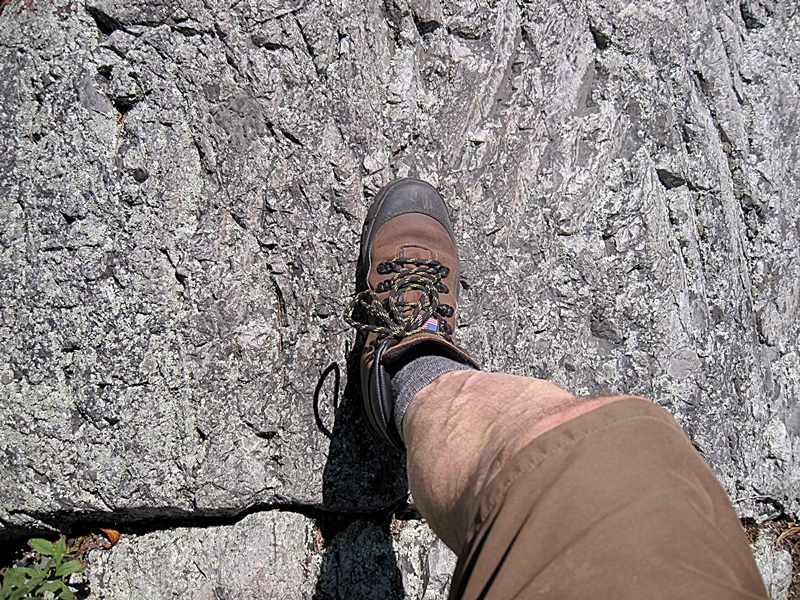 The testing of the Sentinel boots has been rewarding for me because I will now be using this boot for the shorter hikes that I do on trails with irregular surfaces in addition to my backpacks. 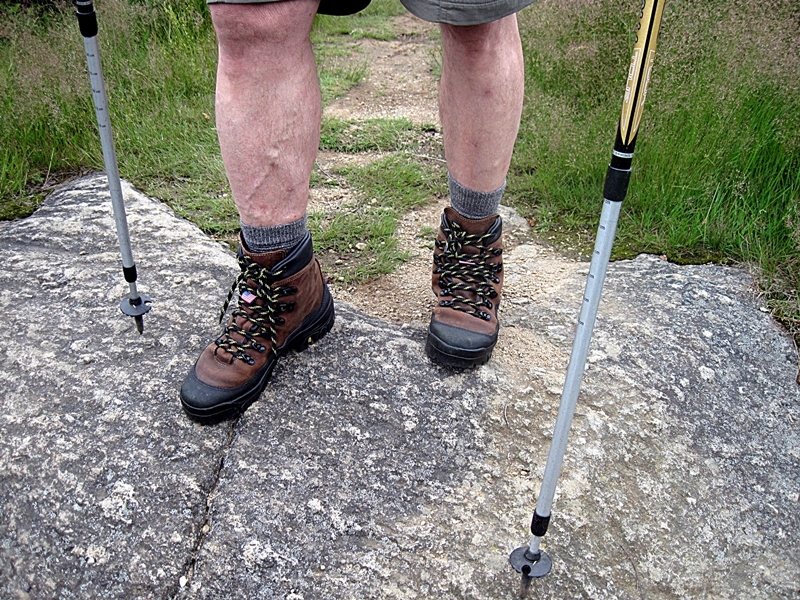 The boot may be heavier, but the overall comfort and reduced fatigue more than makes up for the weight difference. The comfort and the ability of the boot to ventilate are both excellent. 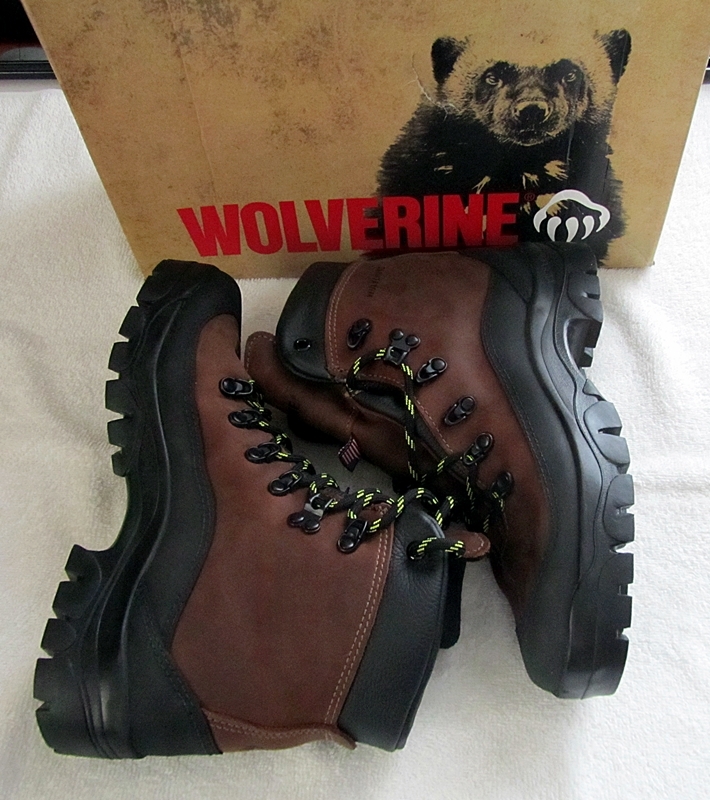 I am looking forward to using these boots on my yearly trip to the New Hampshire White Mountains in November and in winter which will be here soon in New England. I wish to thank 4alloutdoors.org and Wolverine for the opportunity to review the Sentinel Boots.